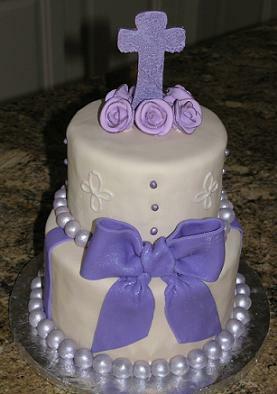 Aimee V. from Raleigh ordered this baptism cake for her daughter Gabriela. 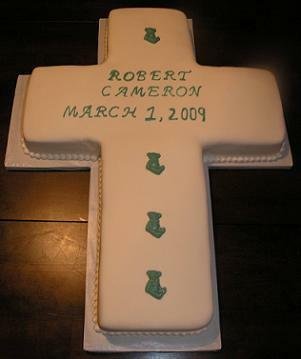 A baptism is certainly a special event to celebrate with a delicious custom cake. The fondant cake flavor was yellow and chocolate covered with marshmallow fondant. The cake filling was butter cream icing. Hand made fondant roses and a large fondant bow decorated the cake that sat on a fondant-covered base. They celebrated her baptism at the Italian restaurant Biaggi’s in Cary. At Piece A Cake we try to design a unique and custom cake to match the person and theme with extra love as our secret ingredient. 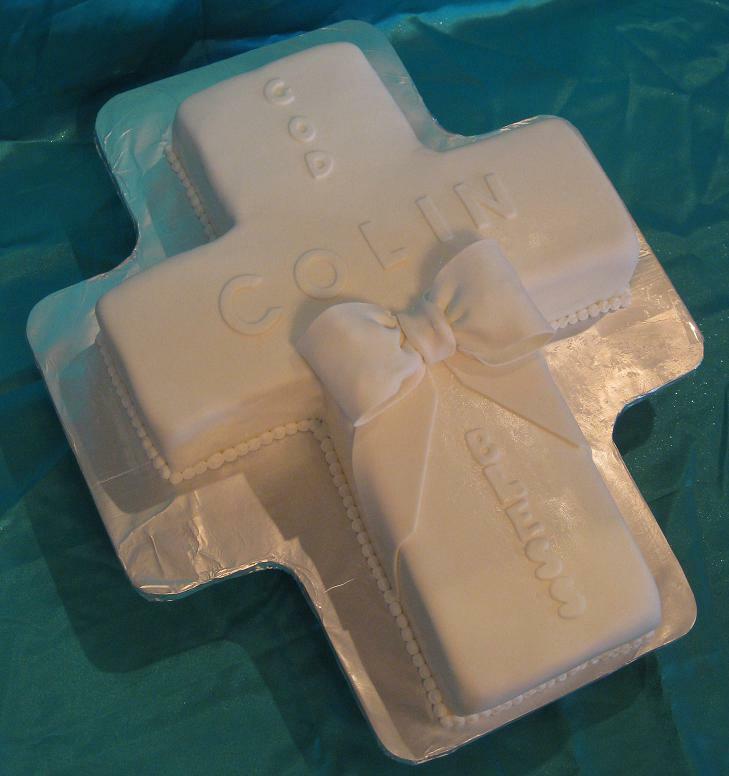 Kimberly of Raleigh ordered this baptism cake to celebrate her son’s baptism. 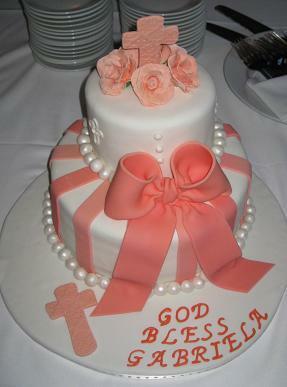 The cross shaped cake was vanilla flavored cake with raspberry filling. This special cake was covered in marshmallow fondant and the teddy bears were made from candy melts. 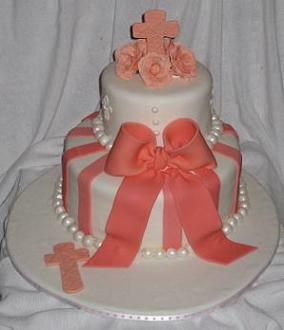 This christening cake was ordered by Lauren P. of Morrisville, NC to celebrate her daughter’s baptism. Lauren’s husband, Josh is an L.A. Lakers player and during off-season lives in Morrisville. 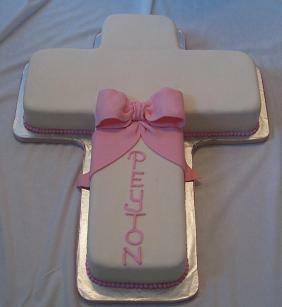 So to celebrate their daughter’s baptism they called upon Piece-A-Cake to create and deliver a one of a kind christening cake. The flavor of the cake was red velvet with cream cheese icing covered with hand made marshmallow fondant. 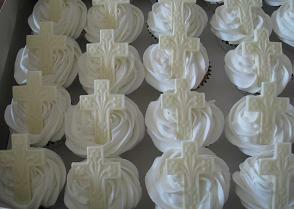 Our christening cakes are made the day before the event to guarantee freshness. Because each cake is uniquely designed we don't refrigerate and store the cakes. You will never taste the refrigerator in our cakes. We are limited to the number of cakes we can accept. E-mail Steph to check availability. 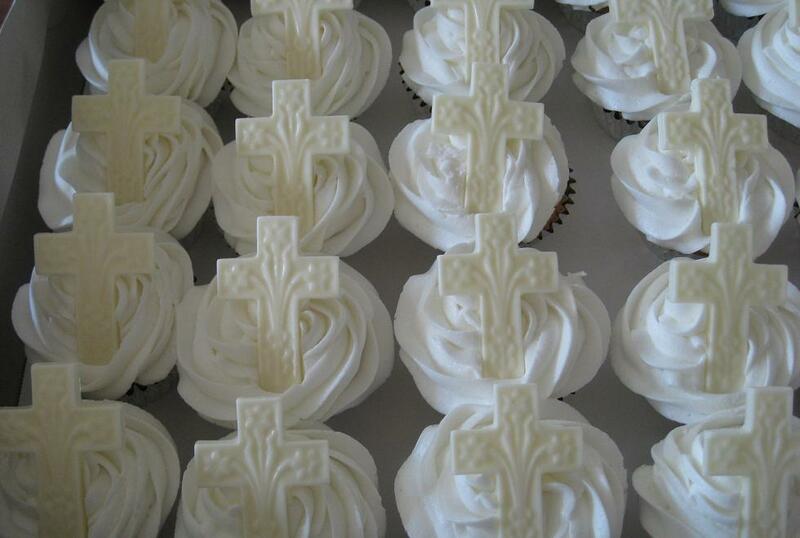 We also provide unique baptism cupcakes. Click on the picture to see close up details. Choose different flavors and frostings to delight every guest. Using candy melts for cupcake toppers is just one of many design ideas. 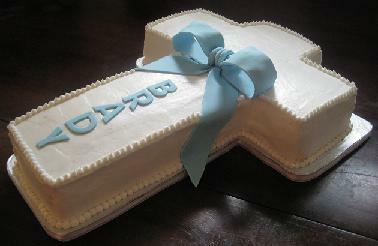 Christina of Raleigh ordered this cross cake for her son Brady's baptism. The cake flavor was vanilla with buttercream and raspberry filling covered in our hand made marshmallow fondant. We hand made a blue fondant bow to accent this baptism cake. 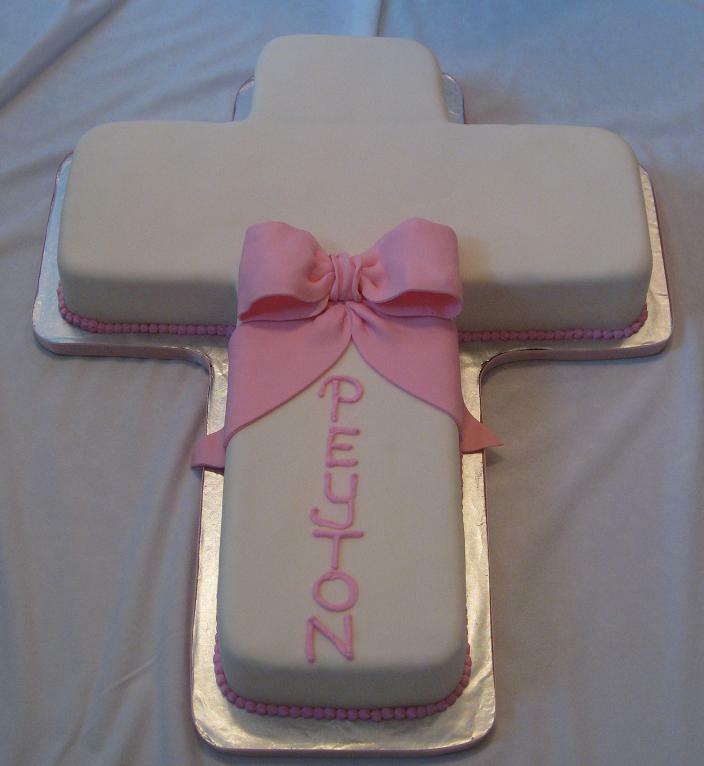 This baptism cross cake was for the christening of Peyton from Carthage, NC. Her mother Stacey C. ordered the cross shaped cake. The flavor of cake was almond with raspberry filling, covered with butter cream, then covered with a layer of hand made marshmallow fondant. We topped the cake with a pink gumpaste bow. 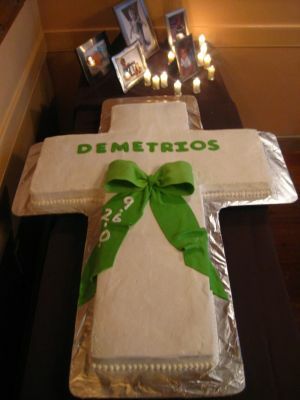 This cross cake measured forty-eight inches and weighed over sixty pounds. It took three tables to hold it!